Nest x Yale Lock Review: Should you get it? This is a Review of the Nest x Yale Lock, a smart lock that integrates seamlessly into your Nest Ecosystem. The lock provides remote management, in order for you to control it when you’re not home. It’s a great addition if you’re into the Nest Products and already own a Nest Hello. Unfortunately, There is no homekit support at this time. For those with Nest Secure security the lock is a no brainer. It can disarm your alarm when you enter the code on the lock. Also, if your WiFi goes down the lock will then use the cellular connector of the Nest Secure if you have that feature added on. Can you unlock it with your voice with Google Assistant from your phone and Google Home speakers? Can multiple locks connect to a single hub? Can this lock send reminder notification if a door has been left open or Unlocked. After few minutes coming home? 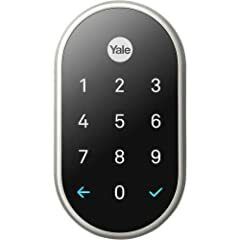 Nest x Yale Lock Review: Is it worth it?